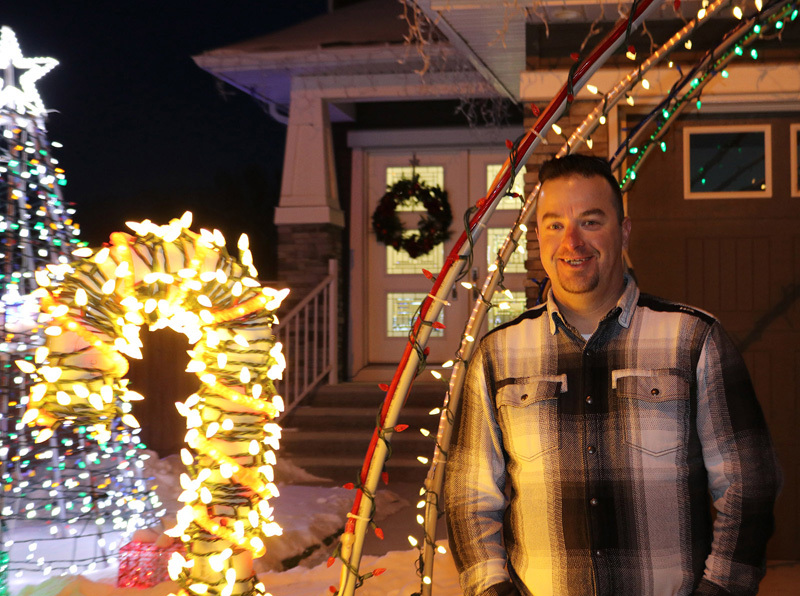 Chestermere resident is illuminating his block in Christmas spirit with 8000 Christmas lights synchronized to carols. “I love looking at Christmas lights, it’s something we always do, and something we always did growing up,” said Christmas lights enthusiast John Jenkins. “It’s easy, cheap and fun,” he said. Families checking out the city’s Christmas light displays ca drive around Kinniburgh Cove, tune into FM 88.5, and watch the dancing lights in time with the music. Jenkins first began with a tiny music box that Christmas lights plugged into, however, as his love for the Christmas lights displays grew he quickly upgraded to the Light-O-Rama program which allowed him to synchronize the lights with the beats in Christmas carols. Jenkins added, he has prebuilt many of the Christmas lights displays in his front yard, however, putting the displays up still takes an average of 40 hours. “It’s scaled down from what I formally would do, I wanted to get some of it up, but I haven’t gotten all of them up,” Jenkins said. He added, the night he put up the display it was blown down after a wind storm came through the city. Throughout the years, Jenkins has had to overcome many weather challenges, and was unable to put any Christmas lights up last year due to poor weather. “Snow is a challenge. I build my display before winter sets in. If it’s an easy snow before Christmas, it’s not too bad. “Since we have a foot and a half of snow I had to shovel my lawn off to see some of the lights. Half of them get buried,” Jenkins said. Although each year has its own set of challenges for Jenkins, seeing the joy in the kid’s faces makes all of the hard work well worth it. “I don’t have kids myself, so I see the joy in their faces when they see it and that’s pretty cool, there’s not a lot of people in this area that do it,” Jenkins said. He added, before moving to Kinniburgh Cove, he would often come home and find Christmas cookies and homemade Christmas cards in his front door.